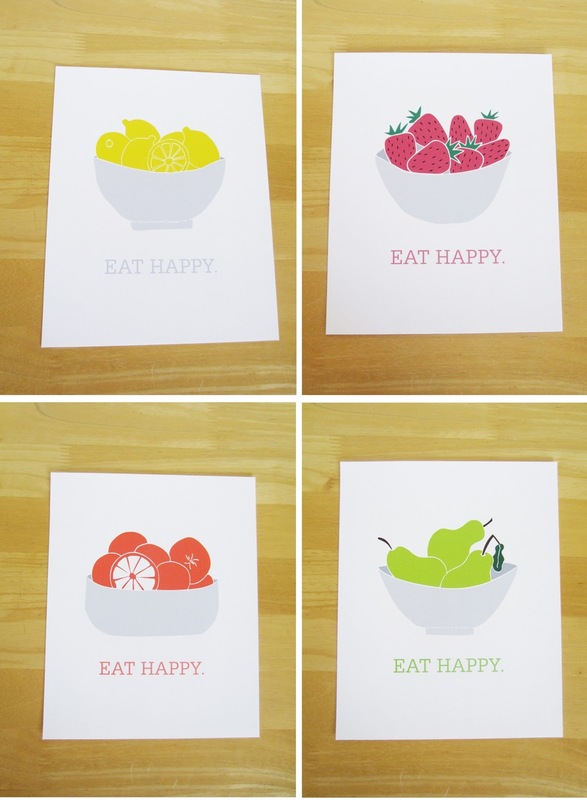 Say hello to my Eat Happy print line! Guys, this line has been in the works for years..! I really can’t believe how long I’ve had this idea, but just couldn’t think of a solution to make it work. Now it looks so easy, but let me dive further into why I couldn’t wrap my head around it. This is my kitchen. And this is a print from a project I did in my Digital Art class over 5 years ago and was the start of it all. The project was learning how to digital paint using Photoshop. So I chose a photo of a nice bowl of delicious raspberries and through a special brush tool, I made it look like it was a painting instead of a photograph. It was pretty neat and fun! And then after I was done, I had the idea to add the “Eat Happy” to bring a twist of graphic design to it. The class was geared mostly towards photographers and graphic designers, but my teacher was a graphic designer and loved it. I dunno exactly what he said, but you know when you just know when someone is actually being truly genuine? That’s what I felt and it was awesome to have that credibility come from a well established designer. Meanwhile, I got married, had a baby and then started this blog and then my Etsy shop. I tried making this school project into a print, but it was not working!! Because it was a photograph, it had a bluish tint all over the background and could not be printed on paper without it looking like a mess. I like clean, and simple. White. This bluish tone was such a nightmare. I tried fixing it, but it wasn’t working. I had the thought to bring in other fruit bowls to have more options, but since I would be selling it, I needed to buy a stock photo. And buying one that is a nice quality with high resolution isn’t cheap. So I decided to wait it out and come back to this idea when I was actually making money and would be able to buy nice stock photos. The making money part still hasn’t happened, so I pretty much just forgot about it and just kept my nice little raspberry bowl to myself. It turned out ok with printing it onto the canvas, but it really looks more blue/grey than a white like how I want it to look. So I got out my sketchbook, looked up some photos to gather inspiration from and I did it! I couldn’t believe how ok it was turning out! They aren’t photo-looking, but once I settled on drawing the bowls of fruit, I knew I wanted that playful, not-crisp-lines look. Then I scanned them into my computer, fixed them up in Illustrator, added color, text, and here they are. One of my most celebrated collections because it took 5 years to do. I’m debating about making options to buy all 4 in 5×7 sizes (with only one having the “Eat Happy” on it), but I figure if there’s a demand, I’ll do it. But for now, all are available in my usual 8×10 size, ready for framing. I haven’t posted them onto the shop yet because I want them to be exclusively available at the Provo Spring Festival this weekend. But later I’ll add them on so they can be purchased at ease online.